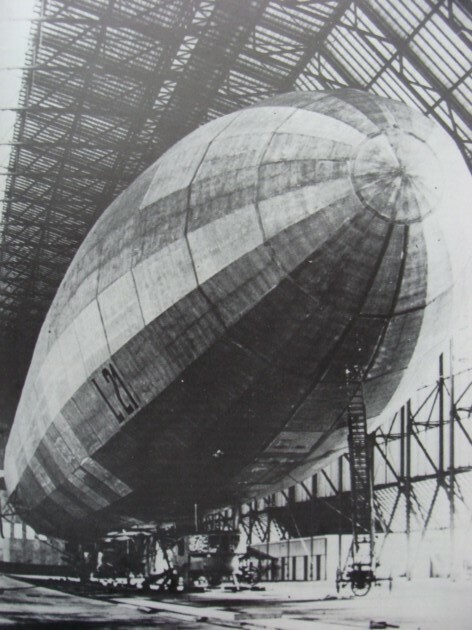 Above is Zeppelin L21 (LZ61) in a hanger at Nordholz Airbase in 1916. 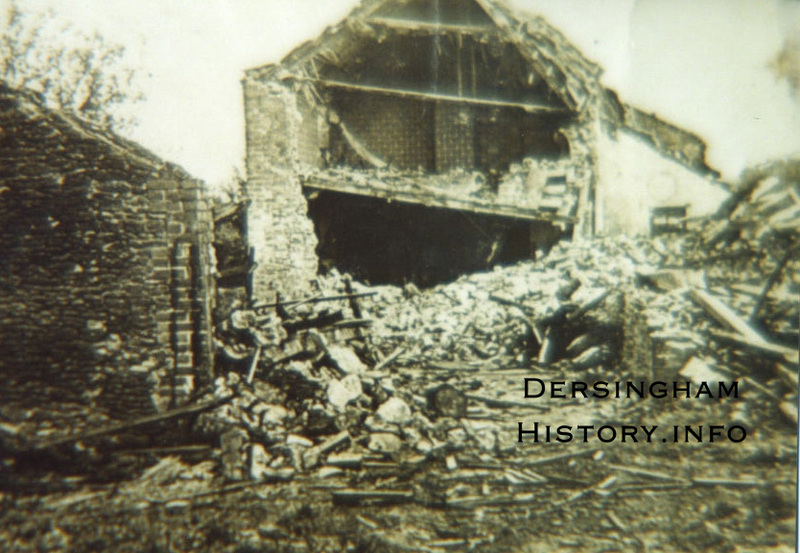 This was the airship that bombed the Dunger home on Doddshill, in Dersingham; the wrecked house is seen below. In January 1900 the vicar of Dersingham sat down and wrote an introduction to the Sandringham Estate Magazine to welcome in the start of a new century; he posed many questions for his readers. Will it be possible before the new century closes to travel to America in three days? Will the daily paper be a thing of the past, and the penny post a matter of ancient history? He wondered if there would be would be eight European Wars in the new century as there had been in the last. Even as he sat writing down his thoughts many men from Dersingham were fighting in the second Boer War. Indeed men from the village had served in many past campaigns including with Wellington against Napoleon. Families here as elsewhere were used to some of their men leaving home to fight in distant lands and they were now to face this yet again as the prospect of another war became a certainty. But this war would be very different to all the others. The villagers learnt about past wars by reading accounts in the local papers, or from letters sent home by the soldiers. They would have listened attentively to accounts of their experiences on the battle fields of the Boer war told by men like Gunner Sidney Rainbow, or colour-sergeant Walter Dyble when they returned home. This time the war was to come right into villages and towns. The horror and terror would be felt first hand. As August 1914 grew nearer there was a great fear of a German invasion and Norfolk, with its open beaches just 80 miles from the enemy, was an obvious target. But this was not unexpected as we had been here before. Hadn’t Napoleon himself threatened just such a tactic? Indeed one elderly resident Widow Hudson , whom many could still remember, used to speak of the time when villagers watched the sea for Boney’s ships and kept their" bits of silver" packed up ready to hide or carry away. Special Constables issued instructions to all households as to what to do should the invasion occur. They were to leave their district as quickly as possible and proceed to the designated areas taking everything they could and destroying anything that could be of use to the enemy. Much more unnerving were instructions in the local paper that all lights should be extinguished as a protection against bombs from enemy aircraft. "It is much better to go home early, or find the way in the dark, than to run the slightest risk of being blown to pieces by explosives from above". This was a new worry and early in 1915 it became a reality. By 10p.m. on the cold winter’s night of January 19th 1915 our village lay in darkness as all warnings had been heeded and no lights were showing.In most houses the children were asleep and the adults were preparing for bed when two loud explosions in the distance shattered the silence. Then the gentle purring of an engine from the sky was heard which grew louder until it filled the parish with a noise described later as equal to the sound of 200 motor cars. Kapitänleutnant Von Platen-Hallermund and the crew of Airship L4 were approaching the village. Von Platen had taken off in his Airship L4 from Fuhlsbuttel on the Elbe, north of Hanover in Germany at 9.05a.m. accompanied by Kapitänleutnant Hans Fritz in the airship L3, and crossed the North Sea to attack England. Although he lost contact with L3 he crossed the English coast at about 7.55 p.m. to launch an attack on Hull. Unknown to the crew they were in fact quite lost. In his report he stated that he turned north to get behind the sea front and attack the Humber Industrial area from the land side. But as he stated later, "I did not find the North bank of the Humber on a North Westerly course." This was hardly surprising, as he had in fact crossed the Norfolk coast near Bacton. He followed the coast and passed over Cromer without realising the town was below as it was in complete darkness. L4 proceeded out to sea but then circled back to pass between Weyborne and Sheringham at 8.30. Von Platen descended to about 800 feet and dropped a flare and two incendiary bombs on Sheringham probably trying to get his bearings. He headed back out to sea but about an hour later he passed Thornham where another incendiary was dropped. He was next seen at Brancaster where, according to a witness, he circled the village twice turning on a searchlight and dropping "a missile containing inflammable substance". L4 then passed over Holme and came to Hunstanton where, according to an official report, at 10.15p.m.a bomb aimed at the wireless station dropped in a field 300yards away. The Lynn Advertiser reported, "about 10.20 the people were startled by the unusual sound of aircraft engines……and the Zeppelin passed slowly over the water tower and followed the shore line to Heacham. No bombs were dropped. The inhabitants seemed to take little more than a mild interest in the passing aircraft and showed no fear or panic." In fact the airship flew over the gasworks, the pier and the lighthouse before proceeding. Several people claimed to have seen powerful searchlights but it would appear that although Von Platen knew he was over a coast he was totally unaware of the darkened town. Apparently the local council, which had decided only a few weeks before that all but four street lights should be put out, changed their minds and ordered all streets lights to be out and all windows darkened.. The report of a bomb was erroneous. It was about 10.40 when the airship flew over Heacham. A witness described the noise as "unusual" and then saw a flash followed by an explosion and a "tremendous flare of light". The bomb hit one of two cottages in Lord’s Lane. It broke off some bricks in the wall, tore off some tiling and part of the wall of the washhouse before falling into a rain tub and blowing it to pieces. Two days after the attack a second bomb, which had failed to explode, was discovered embedded in the soil of a field between the school and the chalk pit. The inhabitants of Sedgeford heard the droning of the engines from about 9.30 to 11.00 followed by three explosions. In Snettisham the airship was first seen hovering over the old Grammar School, which stood at the bottom of the hill leading out of the village. It circled twice before a tremendous explosion indicated a bomb had been dropped. It would appear that the church was the target but fortunately the aim was not accurate as it dropped closer to the Sedgeford road. The church was badly damaged however, with several windows being smashed. Houses near to the crater also lost windows and outbuildings at Manor Farm and the farmhouse had tiles stripped from their roofs. The vicar of Snettisham, who with his wife and friend had left the vicarage "brightly lighted for the entertainment" to go out into the garden to see if they could discover the aircraft they could hear, described in his report to the press, "a long hissing sound, a confused streak of light and a tremendous crash. The next moment was made up of apprehension, relief and mutual enquiries and then all was dark and still as the sound of the retiring Zeppelin speedily died away." The Zeppelin was now flying over Dersingham and the villagers started to come onto the streets to find out the cause of the noise. Meanwhile news of the attack was filtering through to the authorities. At 10p.m. the Chief Constable of Lynn, Charles Hunt, had been told that a Zeppelin had passed over Sheringham and was dropping bombs. He contacted the National Guard and at 10.40 was informed by a colleague in Swaffham that he had heard of the raid and Hunt should warn all the other forces. In a letter he wrote later to the Home Office, Hunt wrote, " About 10.45 when I was trying to get through to Dersingham the Superintendent there rang me up and stated that a Zeppelin had passed over Dersingham and had dropped bombs in the neighbourhood. Before a message was complete I heard bombs being dropped close to this borough." 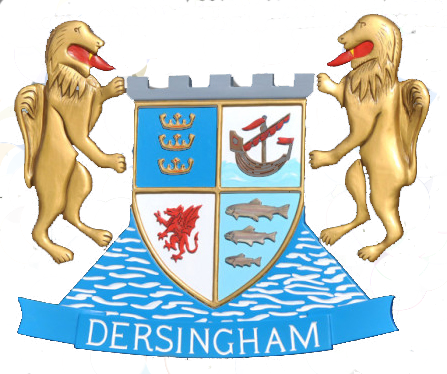 A Dersingham resident wrote a lengthy report for the News and County Press about the sound of a purring engine, "Confound it, I said to myself, J… has got stranded in his car and wants to be put up here for the night." The informant continued," I did not see the airship, but a Dersingham friend tells me that he saw it at the height of about 300 feet above his house. It was cigar-shaped and almost as long as Dersingham station. No lights were showing. One who heard it at the dead of night here described it as equal to the noise of 200 cars." The alarming noise soon caused many more lights to show in the windows and volunteers hastily went round the parish to warn people of the possible return of the airship and lights were quickly turned out. The informant went out round the village. "About midnight I met on the road several groups of people and I would wish to testify to the remarkable calmness which residents showed in the midst of those alarming conditions." He pondered what the position would have been if bombs had been dropped on the village. As the noise of the engines died away the villagers must have sighed with relief but in the following days they would read in the local papers that L4 had continued on to King’s Lynn. There it dropped 8 bombs causing immense structural damage and worse still killing two people and seriously injuring 13. In the days following the attack there were countless rumours that the airship had been guided to its targets by spies in cars. Mr. Holcombe Ingleby the local M.P. wrote several long letters to The Times regarding the allegations. After giving several instances of suspicious activity by cars in Heacham and Brancaster Staithe he quotes a "trustworthy farmer" who described a car that threw flashes of light towards Snettisham Church, which guided the Zeppelin there. "This car re-appeared at the turning into Dersingham and there threw up what appeared to be a definite signal, two upward flashes and one cross flash. At the turning by the church which leads to Sandringham it threw up more flashes." See end of article for a transcription. There was certainly a rumour at the time that Sandringham had been the target. Even Queen Alexandra had written, "This is too bad, those beasts actually went straight to Sandringham, I suppose in the hopes of exterminating us with the Zeppelin bombs- though thank God they failed this time." However, worse was to come for our village. On the night of August 8/9th 8 navy zeppelins crossed over our coast to bomb Hull and the surrounding areas. At 12.30a.m. Zeppelin L16 commanded by Kapitänleutnant Erich Sommerfeld crossed the coast at Brancaster and dropped ten High Explosive bombs and ten incendiaries on and around our village. At Wellswill House, now known as Woodroyal, windows were smashed and ceilings brought down. Robert Alfred Wilkin was the resident at the time. Thirty six other dwellings in the village suffered damage. The cost estimated at £40. However, there was no loss of life. Five minutes later L16 dropped eight HE bombs and seven incendiaries between Dersingham and Wolferton. Fires broke out on Sandringham Warren but many of the local residents and the special constables put them out quickly. L16 then turned towards Hunstanton and crossed back over the coast to return to base. Thus another terrifying night passed but the villagers had more to endure. On the 2nd to 3rd of September 1916 the largest airship raid of the war, with twelve navy zeppelins and four from the army, crossed the North Sea to attack London. However high winds, heavy rain and icing dispersed the fleet and only one came near the capital but 16-17 tons of bombs were dropped from the Humber to Gravesend. At 10.20p.m. Zeppelin L21, part of this fleet and, commanded by Oberleutnant-zur-See Kurt Frankenburg, crossed the coast at Mundesley and after some erratic flying reached Hitchin at 2.25p.m. but then turned away from London and headed north. They dropped bombs at Dunton near Biggleswade at about 2.40a.m.but caused no damage. More were dropped near Gamlingay and 20 minutes later bombs were dropped at Sutton, west of Ely, followed by more at Chatteris. The only damage was to some wheat sheaves and mangelwurzels. By3.35 a.m. L21 was approaching Tilney St. Lawrence where more bombs were dropped followed by others at West Lynn and North Lynn. L21 was now close to our village and by 3.35 a.m. it was over Wolferton where incendiaries were dropped. The villagers here would have begun to hear once again the ominous sound of the engines as L21 approached our village. At about 3.45a.m. Seven HE bombs and two incendiaries fell onto our village and the immediate area. L21 then headed on to Snettisham and Sedgeford where more bombs were dropped before crossing back over our coast at Thornham. Thus in just one month 18 high explosive bombs and 19 incendiaries had been dropped in and around our village. Mr. Cliff Riches recalled these terrifying events in the interview he gave during the Millennium project (the interview can be heard on this web site). He was only four years old but as he said, "When they drop bombs that impress itself on a child’s mind." He recalled the Zeppelin coming over his house from the direction of the sea and that the first bomb fell in what is now Manorside but was then a field. Another bomb dropped on the common and he remembered how the boys would go there to see the crater and collect shrapnel. The Zeppelin dropped the rest on the open fen. He recalled that unknown to the village one bomb did not go off. The next day Cliff went to fetch some corn for his father’s chickens when that bomb exploded and he dropped the corn all over the road. But by far the worst moment during that September night was when one of the bombs hit a row of cottages on Doddshill. The occupants of one of the cottages were George Dunger* and his wife Violet Ellen who was always known as Ellen. Upstairs tucked into their beds were Florence Ivy aged 10, Alice Maud aged 8 and the youngest daughter Marion Irene aged just 5. George’s parents were Robert Dunger and Mary Maria Twite. George was born in 1875 and had three brothers Alfred, Robert, and William and two sisters Martha and Anne. He worked as a Farm servant and agricultural labourer. Violet, or Ellen as she liked to be known, was born in 1881. Her parents were William and Ellen Green. Violet had an older brother John and three younger brothers James, Ernest and the youngest of all Charles. Lilian and Mary were her two sisters and the whole family lived in Wilson’s Cottages. It is also noted that for a time the Greens and Dungers lived next door but one to each other. Both Violet, George and their siblings must have attended the village school which had opened in 1875 so would have been well known to each other. There are reports in the Church Magazine that the Dunger brothers sometimes played for the village cricket team. In 1906 George married Violet in Dersingham Church and they settled into their married life in the cottage on Doddshill where their three daughters were born. Shortly after the outbreak of war on 31st of March 1915 George enlisted. 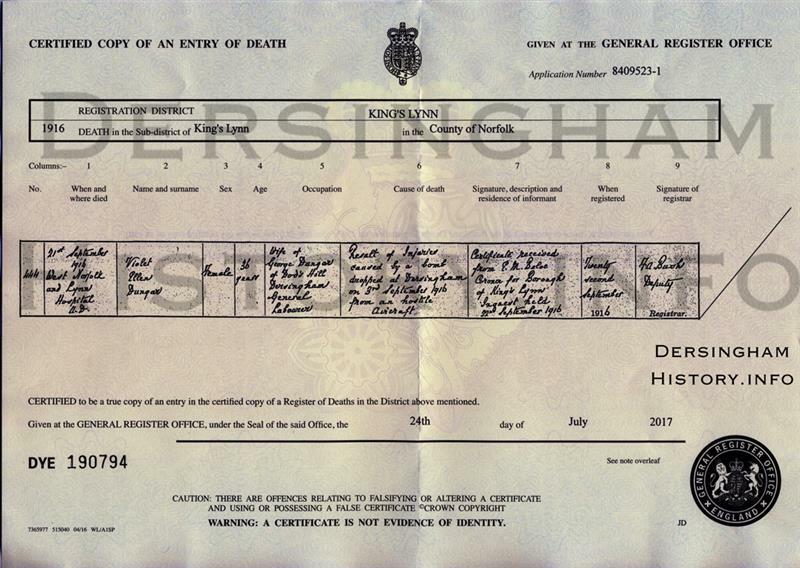 His papers show he was enrolled in the Royal Engineers as a driver and stationed in Norwich. It must have been a proud but worrying time for his family. However, a few months into his service George was taken seriously ill with chronic bronchitis. According to his records it had originated six years previously when he was in King’s Lynn but had flared up again. It was so severe that George was discharged from the army as being no longer physically fit for war service. His discharge papers state that he would have permanent incapacity for one month but then be able to earn a full livelihood. Thus it was that on that fateful night of the Zeppelin raid Ellen was in the cottage with her three children in their beds waiting for George to return home from his day’s work. With the blackout regulations in force it was extremely dark up Doddshill and the story told to me later by several villagers was that Ellen opened her door to let a little light spill onto the path and help George home. (As the bombs fell at about 3.45a.m. this may only be a village tale.) However, apparently she stepped outside, either because she had heard the droning of the engines, or maybe just to see if George was near. It was at that moment that the bombs fell. The devastation was immense. The end wall of the cottage was completely blown out exposing the beds where Ellen’s daughters were sleeping. (see the photograph at the end of this article) Mr. Buckett, a gamekeeper on the Sandringham estate, lived next to these cottages. He fetched a ladder, climbed up and helped the girls to safety. Mr. Buckett’s cottage was one of those damaged and amid the mayhem his two ferrets escaped. Mr. Riches recalled that his parents took him up there the next day, "and some old boy got a collecting box, and was sitting on the bomb crater collecting money". Mr. Eddie Roye’s family lived at Massingham at the time but he remembered his father taking him to Dersingham the day after the raid to check on his aunt who lived in Doddshill. She was alright but had to move to another cottage until her house was repaired. As a child he remembered the bombed cottage and seeing a bed still standing in the destroyed bedroom. The report after the event recorded that six houses suffered serious damage and eight others less so. But what had happened to Ellen? It was reported that three people were injured, one severely. This was Ellen who was rushed to the West Norfolk and Lynn Hospital. For over two weeks the staff at the hospital battled to save her but sadly she died on the 21st September. An inquest was held on the 22nd and the death certificate (see below) records her death as the "Result of injuries caused by a bomb dropped on Dersingham on September 3rd. 1916 from an hostile aircraft". On September 26th the Chief Constable of Norfolk, J.H.Mander wrote to the Home Office informing them of the death of Violet Dunger. The report also stated that there had been severe damage to six houses and slight damage to a further eight amounting to a total value of £500. Seven days later, on September 29th 1916, the villagers gathered to attend Violet’s funeral which was reported in The Lynn News. On Monday the remains of the late Mrs. Violet Ellen Dunger were interred. Rev. A.R.Grant of Sandringham officiated in the absence of the vicar of Dersingham (now on leave owing to ill health). In addition to the relatives a very large number of friends attended. Floral tributes were sent by the husband and children, father and mother, Aunt Priscilla and Uncle Herbert (Necton) Lilly, Polly, John, Jim, Ernest and Willie, Annie, Jim and Evelyn, Messrs Hudson, Walpole, Waller and Daniels, Annie and Honor, mother Martha, and brothers, Mr. & Mrs, Buckett and Mr. & Mrs. Holcombe Ingleby. The two men who suffered some injuries during the raid but recovered have not yet been identified; possibly one was George Dunger. Another reminder of these terrifying events can be seen on the Dersingham Bog where there is a small flight pond for ducks known as Wolferton Splash which although acidic attracts numerous wild fowl. This was formed from the crater caused by one of the bombs dropped in 1916 and later enlarged by George V1. As for L21 records show that it flew 17 reconnaissance missions and made 10 attacks on England unloading 14, 442kg bombs. It was intercepted and destroyed by English fighter pilot Flt. Lt. Egbert Cadbury off Lowestoft on November 28th 1916. George Dunger’s name can be found on the war memorial with others from the village honoured for their service at home. His death is recorded at Pancras London in March 1924 when he would have been 49 years old. Florence Ivy Dunger, their oldest daughter born in 1906, married Walter Paver in 1933 and died in York in Jan.1999. Alice Maud, her sister born in 1908 also died in York in 1987. Their youngest sister Marion Irene, born in 1911, married Duncan Campbell McLeod and died in 1989 in Kingussie and Insh Inverness-shire Scotland. I wonder if they ever spoke of that terrible night when they were so violently awoken, rescued from their beds. *George ‘s family were very difficult to trace in the census returns. As anyone who has tried to research their family history knows names are often recorded in a variety of ways. George’s surname is recorded as Dungar, Dunger and even Danger. Violet is recorded sometimes as Violet but another time her name was transcribed as as Allen and another time as Robet! I have chosen to use Dunger throughout and refer to Violet by her preferred name Ellen. Here is our transcription of one of Mr Holcombe Inglebury's letters to the Times in February 1915.